Thank you for choosing Infraspection Institute for your training course. Here you will find important information regarding accommodations and logistics for our open enrollment classes held in West Windsor, New Jersey. Classroom hours: 8:00 am to 5:00 pm Monday through Thursday. 8:00am to 12 noon on Friday. 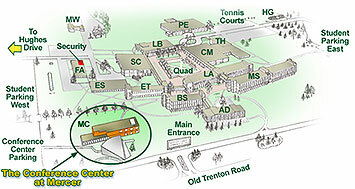 Th e Conference Center at Mercer is a state-of-the-art conference and training facility located on the West Windsor Campus of Mercer County College. Designed with the student in mind, our classroom features comfortable seating that affords an unobstructed view of the large projection screen. Each student desk features a power outlet for personal computers and a data port for internet connectivity. The Center features several breakout areas adjacent to the classroom. 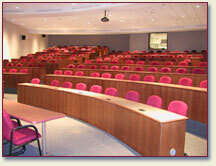 Comfortable seating in these areas provides a perfect place for enjoying a break between classroom sessions. 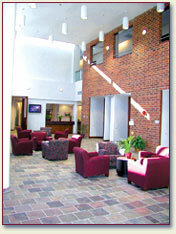 There are several hotels located within minutes of the Conference Center at Mercer where daily classes are held. For your convenience, we have listed several suggestions. Please contact hotels directly for reservations and availability. 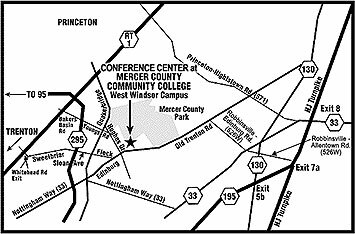 Philadelphia International Airport and Liberty International Airport, Newark, NJ are both located approximately 50 miles from the Conference Center at Mercer. Trenton Mercer Airport is located approximately 13 miles from the Center. Car rental agencies are located at all airports. We will have infrared equipment in the classroom. 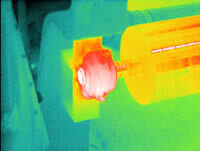 If your company owns an imager, feel free to bring it to the class should you desire additional training on its use. We suggest that you bring comfortable, casual clothes to the course and a sweater or light jacket to wear in the classroom. The classroom temperature is kept close to 70 degrees. For some, it can feel quite cool after you’ve been in the classroom for some time. No recording devices are permitted in the classroom. Infraspection Institute provides all materials necessary to successfully participate in the class including a Student Reference Manual, Exception® software on digital media, calculators, and pens and pencils. If you have any special needs, please call us so that we may assist you with appropriate arrangements. Classes begin at 8 am daily Monday through Friday with a one hour break for lunch. Students will be permitted access to the building beginning at 7:30 am. We encourage you to bring about 20 business cards to exchange with others who will be participating in this class. We hope this information has answered any questions you may have about the logistics of attending your Infraspection Institute training course. Please feel free to call us at 609-239-4788 should you have additional questions. You may also contact us via email at support@infraspection.com. This is probably the best course to obtain theoretical and practical summary of current infrared technology without the sales pitch.